Easy-to-plan creative activities help students build strong relationships and improve their social awareness and self-regulation. Students work diligently on their latest message to a classmate. It’s a big secret and they must work quickly. In just a few minutes, each will have the chance to present their unique creation to a classmate and end the week on a bright note. Why would a child work so hard on such a small project? It’s Friendly Friday! Sometimes Fridays can be tough, especially in the afternoon when everyone is ready for the weekend. After trying a few ideas over the years—from continuing with curriculum content to giving free time—I finally decided to institute Friendly Fridays. During Friendly Friday time, my fourth-grade students do something creative to help them stay focused after a week of working hard. Students pick a classmate’s name from the popsicle stick jar. Keeping the name a secret, they create a friendly, unique note or card to give to the classmate. At the end of the time, I collect the creations, check them over quickly, and then ceremonially distribute them. Students are motivated to do quality work in this fun, positive activity. But giving notes to a classmate is really only the beginning: There are many other ways to create an engaging Friendly Friday activity. Once I check each partnership’s chosen sentences, each student writes it on their drawn hand and decorates the rest of their cutout with crayons, markers, and/or colored pencils. Finally, we glue all of the students’ work together to create a beautiful illustration of how to be friendly to others. Positive Self-Talk: Sometimes we need to remember to be friendly to ourselves. For this activity, we start with a discussion about how the words we say to ourselves affect our own mood and motivation. Then we create a fun display of speech bubbles that hold these positive words. Students can create cartoon heads of themselves or used printed pictures of themselves to attach to the speech bubble. The message is simple but strong: Be friendly to yourself. Who Needs a Pep Talk? This Friendly Friday activity involves a little bit of drama and storytelling. Using prewritten situations, ask your students to give a fictitious character a pep talk to help motivate them to do well or keep on trying. Here are two example situations you could give. First, Suzie has studied hard for the science test, but when she sits down at the beginning of class, she feels like she has forgotten everything. Second, Gino is out mini-golfing with his friends for his birthday party. He is missing the ball every time he swings and is getting frustrated with himself. You can lead a discussion about what Suzie’s classmates or Gino’s friends might say to give a quick pep talk—or better yet, ask a small group of students to create a skit illustrating a pep talk for the situation. Following up with additional situations is key. 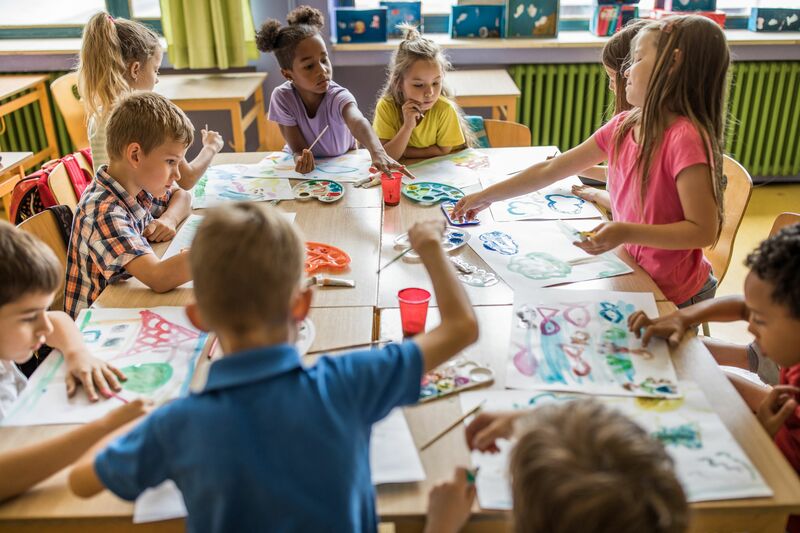 The concept of Friendly Fridays comes out of a branch of arts integration that makes the most of the natural, powerful connections the arts have with social and emotional competencies. Throughout nearly every activity, students are asked to interact and build social awareness. In the note-passing activity, for example, they can see where others may struggle—from paper folding to spelling—and yet, because each note is carefully created, each one is appreciated. Students naturally build relationships as they create and experience art together. With each project, they see and appreciate each other’s talents and challenges, watch as their art is placed together to create a cohesive piece, and—my favorite—interact with each other in positive ways. I see students assisting with cutting, commenting on good work, sharing materials, and smiling. And there’s no doubt that when students create, they’re also working on their self-awareness and emotional regulation. With each project, they work through the creative process, budgeting time and materials and making decisions that will affect how their piece will look and what message it will convey. Friendly Fridays give students the opportunity to work through challenges with the guidance of their teacher and the encouragement of their classmates. The concept of having a Friendly Friday works great for me in my general elementary class, but there are many ways to adapt this idea. Some teachers enjoy using some of these ideas as an extension of their morning meetings. Other teachers in middle and high school adapt this concept by doing something monthly. I’ve even seen teachers introduce the activity in class, assign the creation outside of class, and then bring it back to the classroom in order to distribute the friendly notes and/or reflect on the experience. Regardless, the emphasis is always on allowing for a consistent time for creative activities that promote kindness, friendship, reflection, and social awareness.